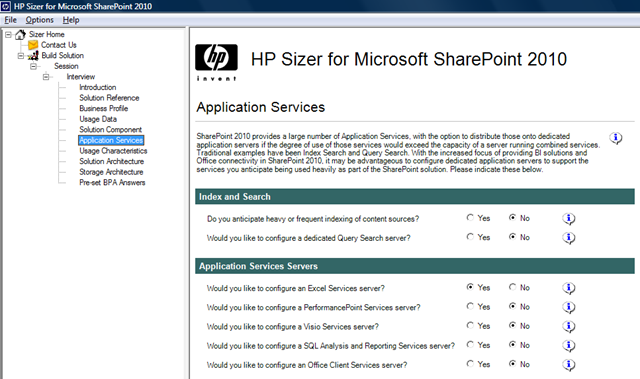 HP Sizer for Microsoft SharePoint is a complimentary planning resource that encapsulates knowledge gained from extensive performance characterization of Office SharePoint Server 2007 and SharePoint 2010 in the HP Alliances Performance and Solutions labs, widespread collaboration between HP and Microsoft, and numerous SharePoint performance whitepapers produced by HP engineering. 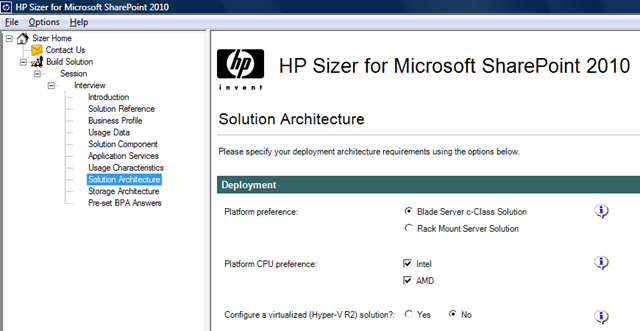 The Sizer offers a quick and consistent methodology for determining and comparing configurations, as well as detailed, customizable server and storage solutions complete with bill of materials and pricing. 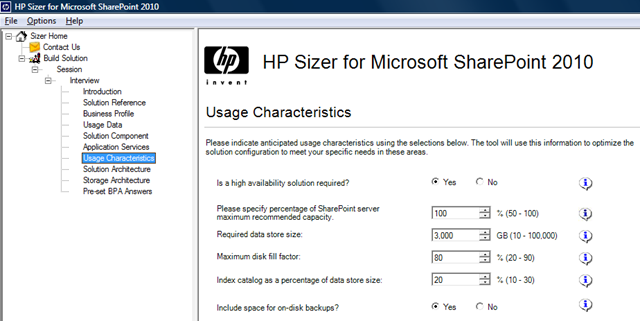 HP Sizer for Microsoft SharePoint solicits data or uses built-in defaults to determine optimal configurations based on SharePoint deployment best practices. Selectable configurations include entry level, highly available, and application optimized solutions. A “what if” feature allows rapid comparison of the effects of workload changes, platform and storage technology selection, and provides role-based server configurations, capacity utilization, and estimated network traffic. Users can select a configuration and then customize their environment by adding or substituting components within best-practice guidelines. 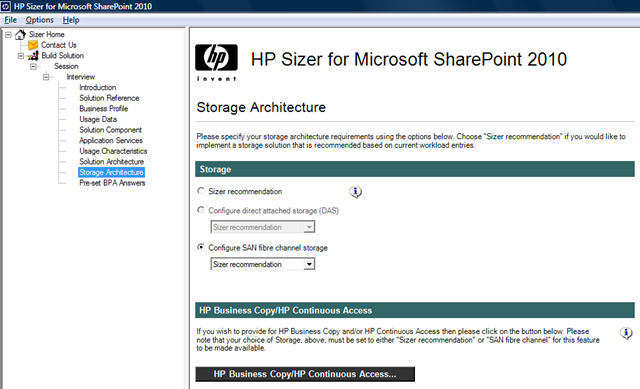 The tool also addresses one of the most critical areas of SharePoint server design: performance and capacity planning for the storage subsystem. Its storage sizing and configuration capabilities offer detailed best-practice storage volume and RAID recommendations to support database and content storage needs using HP direct-attach storage, HP StorageWorks MSA or EVA Storage SAN solutions.